Update 2019: I wrote this plugin in 2007 as a regular old user, a year before I started working with Justin. I don't even think I have the source code any more. For anyone looking for updates, sorry! This plugin has been left on the ash heap of history. Update: if the transport is playing or paused, the notepad now inserts the play position time in front of each line of text. If the transport is in any other state, no timestamp is inserted. Update 26 Nov: The scrollbar is now automatable, useful for lyrics and whatnot. Update 4 Nov: At some point this stopped restoring its text properly when you reopen a project, but it's now fixed. Also I generalized the code so it should work in any DAW host (although the nifty timestamping only works in Reaper, and many hosts may eat action keystrokes instead of passing them to the plugin). Here is a plugin that's nothing but a notepad. You can put a notepad on any track, or on every track, or before each effect on every track, or whatever you want to do. Each notepad should automatically save its text when closed and reopened. The notepad doesn't use any resources when it's not open, and (of course) doesn't touch the audio signal. With Reaper 1.877 or later, the notepad will automatically collect all keystrokes when its window has focus. (With earlier builds, keyboard actions will not make it to the notepad, for example typing "space" will start the transport, etc.) BIG thanks to Justin for adding this hook in 1.877. Please let me know if anything seems wrong (fine to PM). Remember this is a VST and not a Jesusonic effect, so it should go wherever your other VSTs are. makes it a lot easier to take notes of different FX settings i.e., so experimenting will be more fun. I could see it being useful also for quick notation of a chord change, some lyrics or whatever creativity sends to your brain in a flashy moment. I have long yearned for a 'Note' ability in projects, particularly on a track by track and item by item basis. I've just tried yours, and this may well be user error, but i can only make notes by opening the fx and typing in text. Is this what it is designed to do, or am i missing a trick somewhere? I can see the usefulness of this, but i'd really like to put notes in a track, at key points for orchestration, etc... and be able to read those notes as the song progresses. I have this in my VST folder, and it works as a normal VST so far. Any help would be appreciated, because if i can use notes inserted and readable as text in the main window in Items, then i'll be very happy indeed. Alex, what you need is an extra marker track of variable height, or with an extra text box when you edit it. Or markers should have a NOTES box, which is what PT does. Last edited by airon; 07-20-2007 at 02:59 AM. I've just started a FR thread, asking for the team to consider a dedicated 'text track'. I like the idea of this being near the marker track though. Always visible, and no need to scroll. I like the idea of a text track for inserting 'text items' as and when i need them. Thanks for this... i have yet to try it, but in conjunction with the new offing of FX this could come in handy as a way of never having to remove the steps taken for extra CPU and having a description of all the offlined FX. Updated in the first post: if the transport is playing or paused, the notepad now inserts the play position time in front of each line of text. If the transport is in any other state, no timestamp is inserted. Could someone tell me where to put this file...like normally...i just got reaper and this is a really nice plugin? Could someone please tell me where it goes?? Really useful plugin Schwa, thanks a lot! Thanks again for this schwa! Very, very useful plug. Remember the reaper project file *.rpp is human readable, and you can do script stuff with it. I love the timestamp feature! Credit where due, the timestamp idea came from new user Cymbals over in this other thread. I just noticed this now. Thank you so much schwa! User "horn" let me know that this plugin stopped remembering its saved text properly, so I fixed that, it now saves and restores its state properly again. 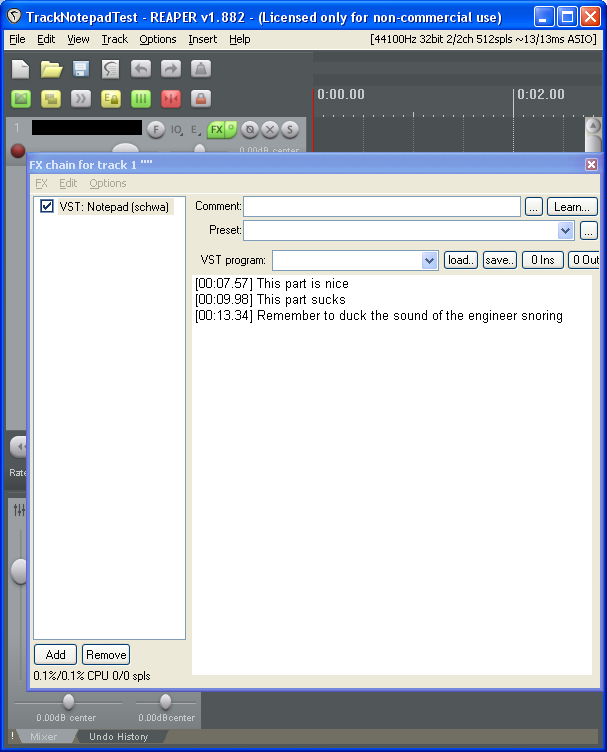 While I was in there I generalized things so it should work in any DAW host, though the timestamping feature works only in Reaper, and also many hosts may eat action keystrokes before passing them on to plugins (for example if the spacebar means "stop the transport" in the host, the host may not pass the spacebar keystroke on to a plugin). Hey, this is cool. Thanks. Without re-opening the whole "should EQ be a plugin or a built in part of a track?" debate, does anyone else think it would be cool to have a smallish (50 chars?) placeholder for notes built into each track? Has this been discussed before? Sometimes I just want to record a few notes about the track without having to load a plugin to do it or reach for a notepad? (eg. which mic, instrument, preamp etc). At the moment I use the track name - which is not ideal but does sort of work is using suitable abbreviations. User "horn" let me know that this plugin stopped remembering its saved text properly, so I fixed that, it now saves and restores its state properly again. Erm, I can't get this to work. Whatever I do, I cant get it to recall the text. Which is unfortunate because this would be really useful. Edit - Yes I can! But you've got to open it from the TCP and not the MCP when you enter the text. Then and only then does it recall. Last edited by spikemullings; 11-05-2007 at 02:46 PM. It's entering and recalling from either tcp or mcp here...did you make sure you had clicked inside the notepad when entering? Ah right, I'll tell you what I did. I had the notepad on the track and opened it from the insert panel on the MCP - that's why it didn't work. Yes it works for me too. I now realise that while I went back and downloaded Schwa's updated vst that dealt with this problem, I didn't actaully swap it in the project. I just tried it with a new project (so the new version of notepad) and of course it works. You're not going to believe me now, but I actually do get through most days without expiring through sheer cretinousness. What is about webforums that awakes my inner fuckwit? Silly demo (warning: 1+ MB animated gif). gone are the days of having word open in the Bg! Whaddya mean silly? Its genius. Wow I just tried this it's awesome! jesus, dude, that could make a fantastic teleprompter for a vocalist. there are some real brains floating around here. -placed the dll file in my vst folder. After those steps I still cant find the plugin. I've also closed/reopened REAPER. What am I doing wrong? Great work Schwa. Ungrateful sloth #2 here...would it be possible to make the timecode format and value follow the currently selected ruler? I haven't tried it yet... seems like more than I want/need, I'd just like the Reaper txt popup that you can have show up on program load to also pop on program close. My desk looks like a Post-It Note factory vomited on it. oh yeah, and perhaps an option to "save text/file as default template"...maybe this can work with a patch i guess? Hi guys, I'm making notes of all these FRs, but realistically I won't be getting to updating this for a couple of weeks, at least. But I do appreciate all the suggestions. Thanks schwa, this is a very useful plugin. I'm using it for lyrics but its kinda hard to read the small font size. It is genius and now that we have track effects just for that clip...it works just on that clip! What's the chance of us getting a 'linear' (track-type) version...?